Landscape Issues is produced by the Landscape Architecture course at the University of Gloucestershire. Bodfan Gruffydd, together with Stuart Sutcliffe and Reginald Dent, developed ideas for the first full-time landscape architecture course in England in 1961. Initially Bodfan, a landscape architect involved in Harlow New Town among others, had been invited to contribute to the Cheltenham architecture course housed in Pittville Pump Room – specifically to offer a landscape perspective to architectural design. His view of landscape was organic, building on landform and climate, with a sound knowledge of plants and creating places of aesthetic quality. From this innovative approach, architects could learn through landscapes. Equally, they thought that landscape architects could share the same opportunities – so why not establish a full-time landscape course? So the nascent course grew from an integration of architecture and horticulture with the second year students spending a residential year at the local Pershore College of Horticulture where planting design and soil analysis were taught. This dynamic symbiosis of art and ecology was central to Bodfan's view of what landscape architecture comprised. 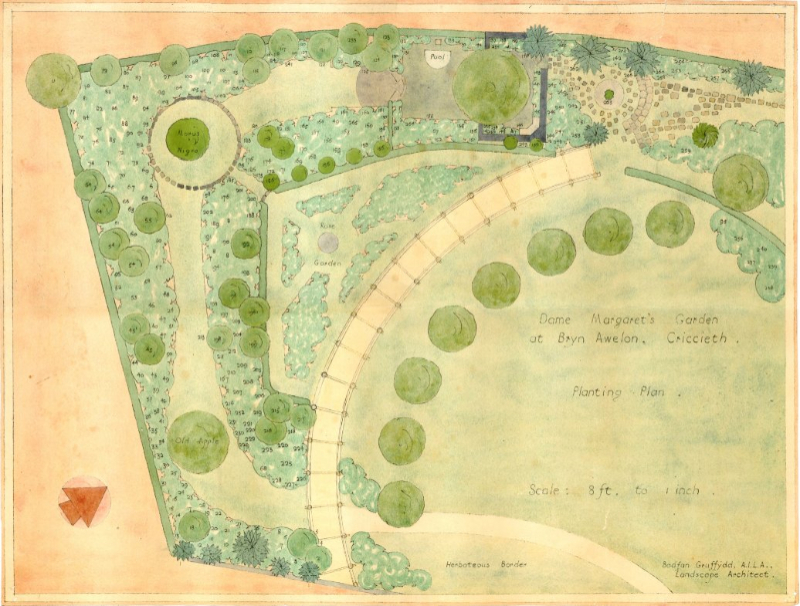 The accompanying illustration shows Bodfan's hand-tinted design for a garden in Criccieth, North Wales (for former PM Lloyd George's wife).